For Family and Friends looking adventure on their next Summer Time, Orlando Florida is the perfect destination on a very easy way to enjoy. With Orlando Discount Tickets USA you not only found the best discount deals on Hotel Stay and Tickets for the Theme Parks but also useful information for the travelers. Here are some very good options for you to enjoy on your next trip which can be booked at www.orlandodisocuntticketsusa.com. Disney World Frozen Ever After: Fans of the successful movie Frozen will go with Anna and Elsa to the wonderful world of Arandelle to enjoy the most popular characters. You will find this ride at Disney Epcot at the Norway Pavillion. Mako Roller Coaster: It is a very popular attraction to be consider the fastest, longest and fearless roller coaster. Visit Seaworld Orlando paying only $29 dollars with Orlando Discount Tickets USA. Skull Island: This is the Reing of the Kong at Universal Studios Theme Parks, here your adventure begins as the gates to the temple that expose a labyrinth of caves. Once you get in you will have a close view as a raging struggle ensues between massive creature before their focus shifts on the credulous riders leading to the big reveal-Kong. Miss Adventure Falls: A water park ride located in Disney Typhoon Lagoon, is this family ride you experience a 2 minutes of splashy family fun aboard a treasure raft venturing out in the high seas. Attractions of the Theme Parks in Orlando are for all the preferences and level of adrenaline, before attending theme parks take a previous look of the rides to save you some time during peak season. To explore vacation packages have in consideration the number of days at the hotel to select the numbers of theme parks you want to visit, star now looking for your next summer deal for Orlando Discount Tickets USA. With March already on the air, you are kind of late to start booking your Spring getaway to visit Orlando Florida. Diferent companies might offers you vacation package at discounted price with Orlando Discount Tickets USA you receive great prices, no hidden term and conditions and the experience of more than 10 years in the market of hospitality. 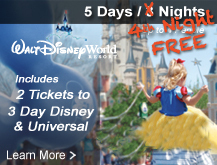 The ticket promotions or vacation packages of Orlando Discount Tickets USA includes diferrent combinations that includes a bonus Disney Water Park. The Disney Water Park are Typhoon Lagoon and Blizzard Beach, both places are ideal entertaimenting and relaxation time while you are in Orlando. sand beaches, lazy rivers, pool waves and more represent a perfect scape to paradise for free. The first Disney Tickets Promotion is only $139 dollars and includes 2 days at the main parks of Disney and the option to visit Blizzard Beach or Typhoon Lagoon. The retail price to get admission for 2 days at Disney and one day in a water park is $279 per person. The Second Disney Ticket Promotion option includes 3 days at the main theme parks of Disney and 1 bonus water parks for the price of $209 per person. The saving per person for this offer is $163 per person because a retail price for the same tickets if $372. The third ticket option includes 4 days at the main park of Walt Disney World in Orlando and 1 optional Water Park for just $239, the savings on this Disney ticket Promotion is $170 per person because the retail price for a ticket like the one described it is $409. The four main park of Disney are Magic Kingdom, Hollywood Studios, Animal Kingdom and Epcot son at any of the ticket promotion you choose you can choose the parks of your preference and one of the Disney Water Parks. Because your probably start thinking on your next summer vacation the best way to enjoy summer is visiting a Water Park with wave pool, slides, water sceneries, beaches and areas where kids can have fun and be safe close to the water. Visit www.orlandodisocuntticketsusa.com to discover your next dream summer vacation paying and affordable price. Described by Walt Disney Wolrd, the International Flower and Garden Festival burst with far-to-table flavors, brilliant blooms, interactive playgrounds and rocking entertaiment. On 2017 the Epcot International Flower and garden Festival celebrates its 24 edition. As in 2016 the evnt will held for 90 days from March 1st – May 29. Participation is very simple and delightfull, you just require general admission to the park is required which is very easy with Orlando Discount Tickets USA tickets promotion for only $39 dollar per person for the first 2 admission. During 2017 new has been reléase with participation of new restaurants, flavors and with evolution on the constructions of the Topiaries to make them look more realistic. The Festival celebrated on Disney Epcot is not only the welcoming for the Spring time in Orlando Florida but also an exquisite demonstration of the blossom of nature apply to the magic of all Disney characters. The event is filled primary with Disney Character Topiaries, a colorful array of flowers, gardens, live music, special presentation (some of this ones with an extra charge). Every year the followers of the Festival enjoy the most popular of the event and also way for the new that will be reveled here at Orlando Discount Tickets USA:. This is the favori time for the Walt Disney World Holiday Tradition in Orlando with sold out admission with a lot of anticipation for the Chrustmas celebrations. The after hours event of Mickey’s Very Merry Christmas Party at Magic Kingdom this 2016 the celebration will held for 21 nights that Orlando Discount Tickets USA will remind you to keep in mind don your vacation planing for the Holidays of 2016. With December under under the roas and passing thanksgiving celebration be prepare the days you select to attend the theme parks in Orlando. If your decision is attend the Mickey’s Very Merry Christmas Celebration pay attention to the last dates of availability or star your day very early to attend to the Christams Celebration for Free on the Christmas Eve Dates. If your choice is still have an unforgetable vacation without attending the Disney Celebration pay also attention to the dates because during the days of special events at least Disney Magic Kingdom is closing the dates for the general admission at 7pm to start the celebration..
On 2016 Christmas Party your family can presence Mickey’s Once upon a time Christmas time parade, an special edition of fireworks with the theme and projections of the holiday festivities and your favorites Disney Character with special attire due to the holiday season. During the after hours celebration is a great time also to enjoy some of your favorites attractions at the park. Rogue One: A Stars Wars Story which debut initiate on December 16th 2016 will have an special event celebration at Disney Epcot. Rogue One: A Stars Wars Story is an epic space opera produce by Lucas Film in which the formation of the Galactic Empire recruits Jyn Erso to work with a team including Cassian Andor to steal design schematics of the Empire’s new super weapon, the Death Star. On Monday, December 5th, Walt Disney World is celebration a Epcot Spaceship Earth into something very special with the use of digital projections to transform the look of the icon structure. The projections on the icon will have updates for the Stars Wars experiences but the event of December 5th will be a projections to resemble the Empire’s famed spaceship. The last time the Disney Epcot Earth was used it was on 2013 with the character of the movie Mike Wazowski the one-eyed green monster. The admissions for the Disney Theme Parks for one day are about $117 dollars per day but you can get these admissions at discounted price for $39 dollars per person by participating on a Resort Preview one of the day that you are in Orlando. With and admission for 4 days at The Major Theme Parks of Disney you give the present of her life to your daughter, even is she is 4 o 15 years old, the magic and the unforgetable memories you can get at the Disney Theme Parks in orlando doesn’t have any precedent. Orlando Discount Tickets USA contrbute to achieve this dream of visiting Magic Kingdom, Hollywood Studios, Animal Kingdom and Epcot with a los price of $239 dollars per person for the first 2 admissions and inform which are the most popular attractiona, rides and experiences that you can plan for the most of the un and special memories for girl. Star planning an unforgetable memory for your beloved family in advance and get information about the offers on vacation packages and options to visit the most magical place on earth with Orlando Discount Tickets USA. 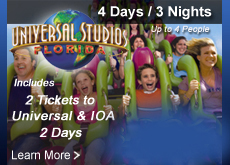 Visit www.orlandodiscountticketsusa.com to find al customize vacation packages for Orlando Florida at discounted price or ticket promotion in combination with Theme Parks like Universal Studios and Seawolrd.